The first of a series of versicles, seventeen in number, chanted on the Rejoicing of the Law in the Northern ritual, before the scrolls are taken from the Ark for the "haḳḳafot" or processional circuits. The chant resembles a Gregorian psalm-tone in structure, and falls in the first ecclesiastical mode (D to D on the natural notes). 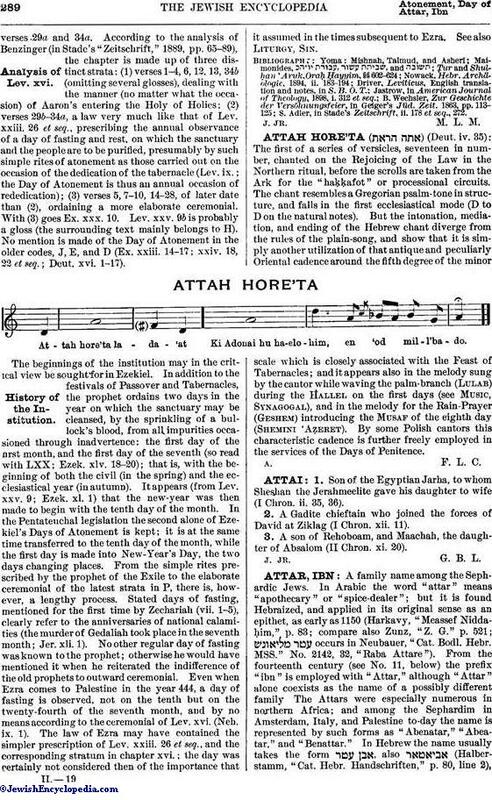 But the intonation, mediation, and ending of the Hebrew chant diverge from the rules of the plain-song, and show that it is simply another utilization of that antique and peculiarly Oriental cadence around the fifth degree of the minor scale which is closely associated with the Feast of Tabernacles; and it appears also in the melody sung by the cantor while waving the palm-branch (Lulab) during the Ḥallel on the first days (see Music, Synagogal), and in the melody for the Rain-Prayer (Geshem) introducing the Musaf of the eighth day (Shemini 'Aẓeret). By some Polish cantors this characteristic cadence is further freely employed in the services of the Days of Penitence. ATTAH HORE'TA A. F. L. C.